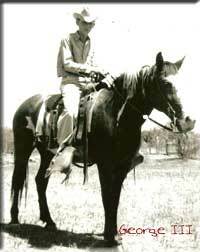 Beggs Cattle Company beginnings started when George Beggs Sr. left Great Britain and traveled to Texas in 1876. He settled in Village Creek, which later became known as Handley, six miles from the growing town of Fort Worth. He leased land in that area and began dealing in cattle and horses. In 1895, Beggs Sr. moved his family to Fort Worth and opened a livestock commission and loan business in the Stockyards District. Growing up around their father's business gave Beggs Sr.'s three sons, William Dickey (W.D. ), John Erin (J.E. 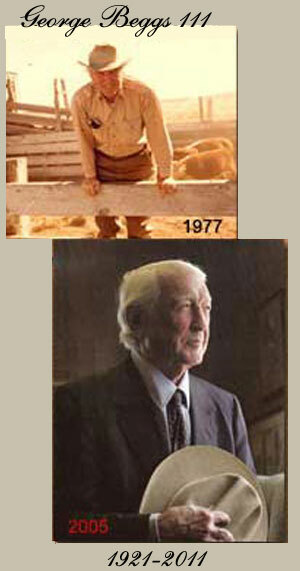 ), and George, Jr., an education in the art of buying and selling horses and cattle. In the early 1920s, W.D. and J.E. Beggs decided to try their hand at the ranching business and began operating as the Beggs Brothers leasing land at Bluff Dale and later at Wellington, Texas. In the meantime, Beggs Sr.'s best friend, E.D. Farmer, hired George Beggs Jr. to manage his real estate ventures in downtown Fort Worth. Soon after, Beggs Jr. opened his own office. In 1923, W.D. and J.E. (Crowbar) Beggs found a ranch they wanted to purchase in West Texas and it was then Beggs Jr. joined them in partnership. During the next 20 years, the three brothers purchased ranches in Parker, Garza, Kent, Dickens, King and Stonewall counties. The Beggs brothers used the "lazy 3" brand on their cattle and horses. W.D Beggs worked the ranches in West Texas while "Crowbar" worked cattle on a ranch in Parker County. 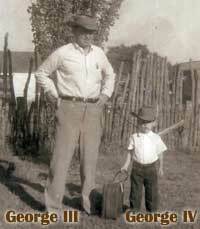 George Beggs Jr. manned the financial end of the growing ranching business in Fort Worth. E.D. Farmer died in 1923 and because of his close relationship with Beggs Jr., Begg's spent several years working with his estate and finally succeeded in purchasing his mentor's cattle ranch near Aledo. Growing up around the horses and cattle and learning the ins and outs, it was only natural that Beggs Jr.'s sons, George Beggs III and Ed Farmer Beggs would want to "take the reins" of the operation and started with the ranch near Aledo. 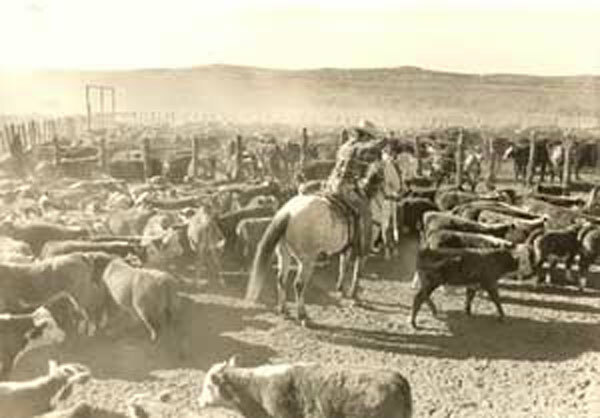 One of the first orders of business was to change the name of their holdings to Beggs Cattle Company. With the new name came a new brand for their livestock which is the English Pound sign. This was decided due to their grandfather's ties to Great Britain. Sadly, four months had not gone by when Ed Farmer Beggs was accidently killed. It was then George Beggs III assumed full responsibility for the operations. 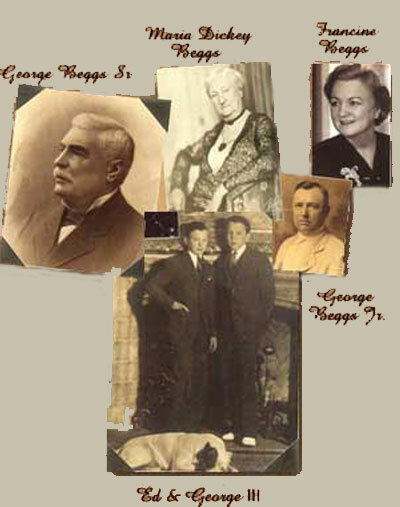 He and his wife, Janie, raised all four of their children (George IV, Ed, Janie, & Judy) on the Parker County Ranch. It was inevitable George IV and Ed would join their father in the family business. 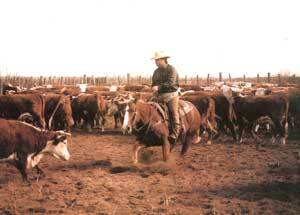 Today, the Beggs Cattle Company raises commercial cattle and quarter horses. The ranching business is still done the traditional way using horses. Maintaining and preserving the Western Heritage earned Beggs Cattle Company the Charles Goodnight Award in 2005 and was awarded the American Quarter Horse Association's Legacy Award in 2003 in honor of the ranches' 50 years in the registered quarter horse business. They began raising horses in the early 1900's long before there was an association or registry. Ed Farmer Beggs II operates the ranches located in Parker County while his brother, George Beggs IV manages the ranches in King, Kent, Stonewall, Dickens, Garza and Cochran counties.